15 inches long, made of cold cast resin and hand painted. 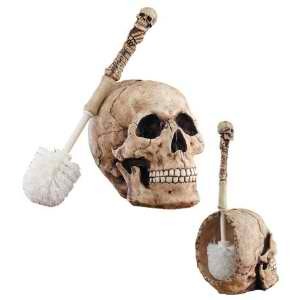 And, YES, you get the skull with the brush, they are sold as one item, the brush fits inside the skull. Trust us on this one folks! This item has been discontinued by our supplier. These are in great demand and we purchased several of them before the discontinuation. Once they are gone, that's it. Shipping on this item is cheaper using FEDEX. The Post Office is more expensive on shipping some of our statuary items. We'd be glad to get you a quote via FEDEX, just contact us!